One of the most glorious things about being a parent (and unschooling parent at that) is the sitting back and watching your children bloom. Lately I've been in awe of our two children as they take on new challenges in various ways. I find it so fascinating to view the world through their eyes, something we expect to do as parents to toddlers or young children, but now that I'm the mother to two in their so-called tween years, I find myself constantly amazed by their observations, their very processing and understanding of their world. I feel profoundly lucky and honored to be able to conneceted to them as I am and that they let me in the way they do. Adam, who is nearly 10 and adores building with Legos, has the ability to see whole worlds and machines in his head and then designs those worlds with Legos. And then he photographs it. His pure imagination combined with wit has my jaw dropping daily. Here's a sample of his engineering (as we refer to it.) To see more of his photography, view his Flickr page here. 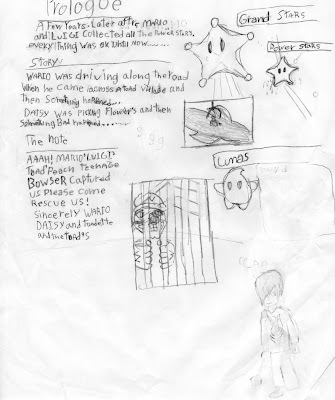 Adam has also been designing and writing Super Mario Galaxy 2 (there is only Super Mario Galaxy, until Nintendo hires him and his friend Sebastian, that is.) 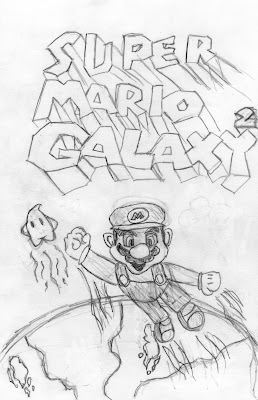 Having completed playing the first Galaxy for Wii, he decided that what the world needed was a second game. 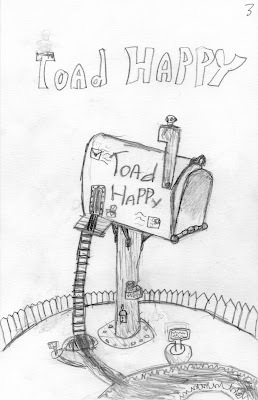 So far he has about ten drawings and storyboaords completed. Here's a sample. Adam is also currently taking a writing class and his since written five chapters of a story he has titled Earth's End. It's an action-packed, futuristic adventure about invading armies from another galaxy and the partial destruction of planet Earth. Of course, each chapter is replete with illustrations of humongous space ships, Gork Kings and molten earth. He works on his story diligently and we always look forward to the next installment. Olivia, who is 12, is what is known as a Twilighter. She's always had a fondness for the dark, urban, dystopic, futuristic and now, Gothic. As such, her writing and photography reflect these interests. Since Olivia was given her own camera for her birthday, she has taken it everywhere. Again, the innate talent for observation is present with her also and I'm always thrilled and amazed by the images she collects. To see more of her photography, see here. Olivia has also been writing frequently, especially since starting her own blog and taking the same writing class as her brother. For next week, their assignment was to write a poem, for which Olivia used one of her own photographs as inspiration. I admire her ability to imagine and attribute intense emotions to something as simple as a single leaf on a tree. When I visit her photostream, I find she has often titled photos with whole passages from books that she has read, extracting the words to match her images with precision. I love that she and her brother can take seemingly unrelated things and combine them into another art form. Adam, with his Legos in everyday settings that hint at the absurd or droll and Olivia with her snatching of the ordinary and transforming it to otherwordly. What beautiful minds. What an amazing gift to be allowed a view into their world. Wow, you have been blessed with amazingly creative and gifted children.. the photographs are beautiful. That last photo is just ... beautiful! So beautiful your children are. Amazing photos and I love that Olivia puts words to her photos from literature. You are such a good mom for encouraging this! I just know that if our children were in school we would miss a lot of their natural abilites and interests because they would be too busy in school all day and then doing homework! Really love this post. I just love Adam's Lego workout scene! Very creative. His drawings and photography are amazing! Olivia has a photographers eye for sure. I love the color in the construction photo! Hey, thanks, Erin! I feel blessed and I can't wait to get clothes out on the line with regularity. Up until last week we had a giant snow pile under my laundry tree. skymring--welcome and I'll let her know. Thanks! Lisa--thanks so much! I'm happy our love of books and reading has rubbed off on the, certainly. Yes, I can't imagine missing all of this beauty. Anet--that workout scene cracks me up. Thanks, I'll let them both know. i love the lego gym. way way back when i was still building with legos, i loved to make "everyday" things with them... hotels, gocery stores, hospitals, etc. oliva's phots and poem... wow. just beautiful.